Caribbean Stud Poker is gradually gaining in popularity as compared to its stud twin: Texas Holdem mainly because it is an easier game to learn and you can play it face to face and still enjoy. Originating in the Caribbean and based loosely on five card stud poker rules, this game offers a fan alternative to traditional table games with an opportunity to place a side bet and hit a big jackpot too. Some of these jackpots are progressive and you can win millions of dollars if you break those machines or tables.. It is not a traditional poker game in the sense that you play against the other players and the best player wins the pot. Caribbean stud belongs to the family of games including Pai Gow poker, Let it Ride and Three Card poker for example, where your opponent is the dealer and your goal is to form a better poker hand than the dealers hand. However, basic knowledge of traditional poker hand ranking is required. 1) The game begins with the players placing an ante bet at the same amount as the table minimum on the ante circle on the table. 2) At the same time, you should decide whether to place an additional side bet for the progressive jackpot. 3) Then, the dealer deals each player five face down cards plus four face down cards and one up to himself. 4) After looking at your cards, you should decide whether to fold or to call. If you decide to call, you should place an additional bet double the amount of your former ante bet. 5) After all the players have made their decisions, the dealer shows his hand. In order to qualify in a Caribbean stud poker game, the dealer must have an ace and a king or better. If he does not qualify, you will be paid back your ante bet but the call bet is a push. 6) If the dealers hand qualifies, he compares hands against each of the players individually. If his hand is better than yours is, you lose both your ante and your call bets. 7) If your hand is better than the dealers hand, you would be paid even money for your ante while for your call you would be paid according to a paytable. The paytable can vary from one casino to another. 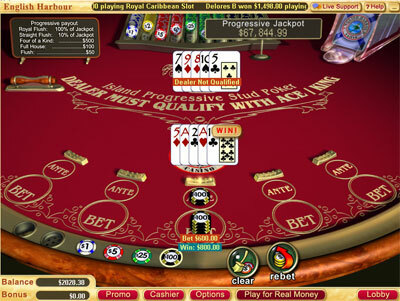 Generally, US casinos pay out 50:1 on a straight flush; 20:1 on four of a kind; 7:1 on full house; 5:1 on a flush; 4:1 on a straight; 3:1 on three of a kind; 2:1 on two pairs and even money on one pair or less.<br> In case your hand and the dealers hand are even, both ante and raise will push. One of the reasons that Caribbean stud poker is so popular is the option of placing a one dollar side bet and winning a large progressive jackpot prize. In order to qualify for the bonus payout you should have a flush or better. For a flush, you would be paid a 50 dollars bonus and in order to win the jackpot that usually resets from 10,000 dollars, you must have a royal flush. However, your chances to hit a royal flush are estimated as about 650,000 to 1, therefore I would recommend skipping it.